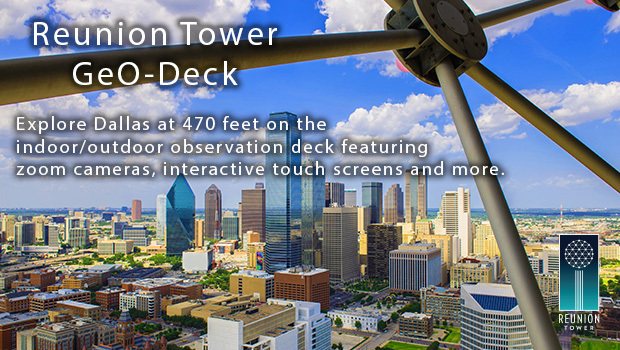 From 470 feet up you'll experience breathtaking 360-degree panoramic views, high-definition zoom cameras, interactive touch screens, telescopes, photo ops and an indoor/outdoor observation deck that lets you see for miles in any direction. The journey begins in our PIX photo experience at the bottom of the tower. Guests are able to take their photo in front of a green screen and change their backgrounds to one of six images of the Dallas skyline. Next, guests board the elevators that are ready to usher them 470 feet in the air in 68 seconds to the GeO-Deck. This indoor/outdoor observation deck lets guests explore the city unlike anywhere else. Step up to the interactive touch screen Halo and with just one swipe discover local hidden gems, historic landmarks, museums, parks and much more.